Riveting, emotionally fraught and heartbreakingly honest, The Hate U Give is one of the most powerful YA contemporaries I’ve read till date. You know, all the hype and attention this book has been getting, all those raving reviews, they are all true and well deserved. Anyone who has read the premise, would know that this book is inspired by the Black Lives Matter movement. 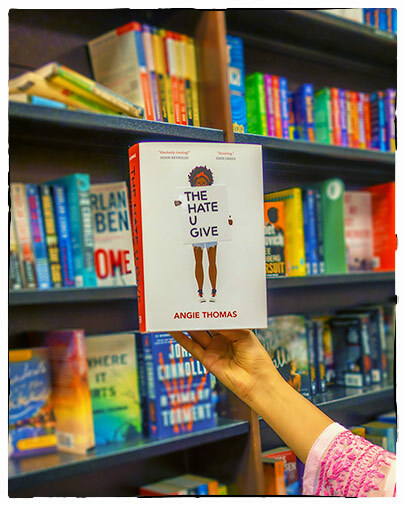 The injustice, police brutality and racial bias for the innocent Black community is a very, very important subject that needs to be addressed and Angie Thomas has done so with a fervor that would resonate with the young minds for years to come. The Hate U Give, written in the first person narrative, is voiced by the innocent, sixteen-year-old Starr. One night, after returning from a party with Khalil, her childhood best friend, a cop pulls them over and Starr witnesses the most distressing event of her life – the murder of non-threatening, unarmed Khalil for doing absolutely nothing wrong. The cop who stopped them, put multiple bullets into Khalil while Starr sat watching helplessly as her best friend lay bleeding and dead on the streets in the middle of the night. The gist of the book is how Starr deals with the consequences of this devastating tragedy. How she goes through every stage of grief, never once being able to accept that Khalil is actually gone. Her rage towards her friend’s murderer, her determination to do everything possible to get him justice, and also her unspoken fear that justice won’t be served. Its an intense read, heavy with emotions, but along with the socio political issue that it takes into account, it is also funny and hopeful. The character dynamics is pure brilliance. Starr’s family is perhaps one of the most realistic, supportive, loving and close knit-family I’ve read about. Its commendable how smartly Angie Thomas has rendered the complex relationships amongst various people in the two worlds that Starr is caught in between – one of the rough, poor, Black neighborhood that she lives in and other of the rich White elite prep school that she attends. All characters in this book feel real and involved rather than clichéd and made up and this story, though a work of fiction is utterly close to reality. I’d say read it, not only for its significant social message but also because its a fantastic and memorable story that deserved to be told. John Green might be right in his saying that this will be remembered as a classic of our time.